West Windsor, N.J. –As part of its yearlong 50th anniversary celebration, Mercer County Community College (MCCC) will host “PlayFest 2017” next spring, the first New Jersey community college new play festival. The competition is open to all student playwrights and actors from the state’s 19 community colleges. Community college alumni are also invited to participate. Submission categories include full-length and one-act plays, as well as musicals and plays with musical accompaniment. The winning productions will be presented on stage at MCCC’s Kelsey Theatre the week of March 7 to 12, 2017. In addition, cash prizes will be awarded to the college(s) of top playwright(s); the playwright who submits the overall winning script will be awarded a slot for his/her production in Kelsey Theatre’s 2017 summer season, according to Kelsey Artistic Director M. Kitty Getlik. Entries will be accepted from Oct. 1 through Nov. 15. Submission and production of plays will be coordinated through the playwright's community college. Playwrights should contact the appropriate department – either English or Theater – at their college to determine the contact person for the PlayFest. Each school may select one full-length play and up to two one-acts for submission. Scripts will be judged by a panel of theater professionals, with the winning scripts to be announced in January. Festival chairman LouJ Stalsworth explains that the productions will be bare bones, using the fringe festival model. “Our focus will be on the written word, not production values. Load-in and load-out times will be limited, allowing for a maximum number of plays to be seen on stage,” he said. 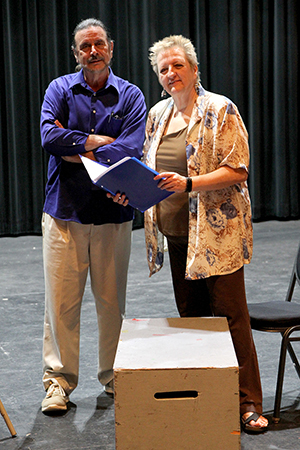 PlayFest Chairman LouJ Stalsworth and Kelsey Theatre Artistic Director M. Kitty Getlik on stage at Mercer County Community College. Stalsworth is an MCCC adjunct faculty member who teaches playwriting and world theater, and was the director of two large-scale student shows: “Romeo and Juliet” (2015) and “A Midsummer Night’s Dream” (2016). He is the artistic director for PinnWorth Productions, which performs at Kelsey Theatre, and is a former New Jersey State Fellow in Playwriting and a Virginia Center for the Creative Arts Fellow. He has an MFA from Rutgers University’s Mason Gross School of the Arts. Kelsey Theatre was established at MCCC’s West Windsor Campus in 1972 and has served as vibrant theater destination in Central New Jersey for more than four decades. Under the direction of M. Kitty Getlik, the theater is currently home to 12 community theater companies and MCCC's Academic Theatre/Dance Program. The theater offers productions year-round, including full-length plays and musicals and a children's series. More about Kelsey Theatre can be found here. For further details, visit www.mccc.edu/playfest2017. Questions may be addressed to playfest2017@mccc.edu.